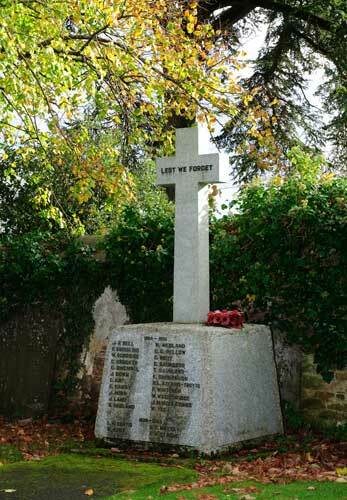 In 1996, the villagers, supported by the local branch of the Royal British Legion, united to build a lasting memorial to the men of the village who had given their lives in two world wars. This stone cross replaced two wooden plaques in the Northlew and Ashbury Churches. It cost £3000, money which had to be raised by local fundraising over many months and was unveiled in June 1996 by Garfield Gay, whose uncle of the same name is listed below and who had been the driving force behind the building of this new and more lasting ttribute to the men..
8/1937 Private John Fox Bell of the 1st Battalion, the Otago Regiment, the New Zealand Expeditionary Force. Son of Charles and Elizabeth Bell of Derbyshire. Born in Belper in the September Quarter of 1881. Died 26 July 1916 aged 35. 103063 Private Frederick William Brooking of the 177th Company, the Machine Gun Corps. Son of William and Amy Brooking. Born in Northlew in 1898. Died 26 September 1917 aged 19. 11541 Private William Henry Karslake Burridge of the 1st Battalion, the Devonshire Regiment. Son of John and Ellen Burridge of Winsford Towers, Beaworthy. ; husband of Annie Burridge. Born in Northlew in 1889. Died 30 May 1915 aged 26. 20091 Corporal Charles Crocker of the 6th Battalion, the Prince of Wales' Leinster Regiment (the Royal Canadians) formerly 2068, the Royal North Devon Hussars. Son of Edith Crocker (w). Born in Northlew in 1895. Died 14 September 1917 aged 22. 200091 Gunner Charles Dingle of the 3rd Battalion, the Australian Field Artillery. Son of John and Hannah Dingle. Born in Great Torrington in the March Quarter of 1861. Died 22 October 1917 aged 56. 11266 Private James Down of the 1st Battalion, the Devonshire Regiment. Son of James and Eva Down. Born in Inwardleigh in the September Quarter of 1897. Died 22 April 1915 aged 18. 345732 Private Ernest Garfield Gay of the 16th Battalion (Royal 1st Devon Yeomanry and Royal North Devon Yeomanry). Born in Northlew in the September Quarter of 1895. Died 20 October 1918 aged 23 when he volunteered to "go over the top" in the place of a married man. 12598 Private Edwin Harry of the 2nd Battalion, the Coldstream Guards. Brother of John Harry of Millton Farm, Northlew. Born in Halwill in 1861. Died 30 November 1917 aged 56. D/19602 Private John Horn of the 5th Battalion, the Dragoon Guards. Son of the late Alexander and Charlotte Horn of Northlew. Born in 1887. Died 26 March 191`8 aged 31. 7799 Sergeant Jacob Land of the 9th Battalion, the Devonshire Regiment. Son of George and Mary Ann Land; husband of Ellen Land. Born in Bampton in 1887. Died 26 October 1917 aged 30. 27852 Private Sidney John Medland of the 2nd Battalion, the Hampshire Regiment. Son of Charles and Louisa Medland. Born in Bridestow in 1897. Died 16 August 1917 aged `19. K 31033 Stoker 1st Class John William Medland of the Royal Navy, HMS Good Hope. Son of Maria and the late Thomas Medland; husband of Emily Medland. Born in Northlew 1 March 1886. Died 1 November 1914 aged 28 at Coronel when his ship was lost. 203175 Private George Glass Pelloiw of the 1st/6th Battalion, the Devonshire Regiment. Son of George Pellow who died when this George was 11 when he became an orphan. He was sent to live in Bristol at Muller's Orphan Houses. Born in Northlew in 1890. Died 23 October 1917 aged 27. 234517 Private Christopher William Rout if the 11th Battalion, the Worcestershire Regiment. Son of George and Emma Rout. Born in Diss in the March Quarter of 1894. Died 25 September 1918 aged 24. 11219 Private Charles Saunders of the 2nd Battalion, the Devonshire Regiment. Son of William and Elizabeth Saunders; brother of Tom (see below). Born in Northlew in 1898. Died 1 July 1916 aged 23. K 5264 Leading Stoker Ernest Philip Shobbbrooke of the Royal Navy, HMS Indefatigable. Son of Philip Shobbrooke and the late Charlotte. Born in Plymouth in the December Quarter of 1891. Died 31 May 1916 aged of 24 at the Battle of Jutland. Lieutenant-Col. Hugh Leonard Acland-Troyte of the 4th Battalion, the Devonshire Regiment. Son of Colonel Charles Walrond and his wife Katherine; husband of Helen Chapman. Born in Bampton in the December Quarter of 1870. Died 17 April 1918 aged 47. 2034 Private Frederick Whitcher of the 24th Wessex Field Ambulance, the Royal Army Medical Corps. Son of Harry and Isabella Whitcher of the Lodge, Ashbury. Born in Attleborough, Norfolk in 1892. Died 22 May 1915 aged 23. 28753 Private William Wooldridge of the 8th Battalion, the Devonshire Regiment.. Son of Mary Jane Medland and the late William Wooldridge (husband of Jane Medland (late Wooldridge, formerly Tancock ) of Northlew. Born at Little Croft, Okehampton in the September Quarter of 1892.. Died 6 May 1917 aged 25. Major John Morth Woollacombe of the 1st Battalion, the Devonshire Regiment. Son of the late Henry Woollacombe. Born in Exeter in the September Quarter of 1878. Died 3 February 1917 aged 39. PLY 16358 Private Wallace Yeo of the 2nd Battalion, the Royal Marines. Son of the late Thomas and Elizabeth Ann Yeo. Born 2 September 1895. Died 26 October 1917 aged 22.